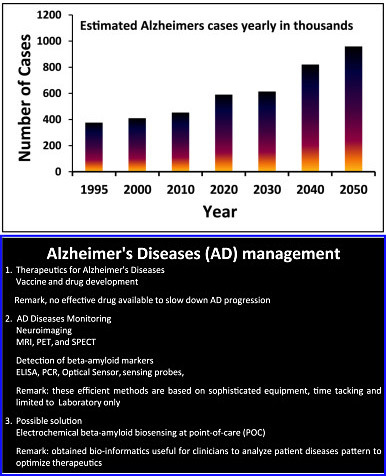 Alzheimer’s disease affects about 17 million people worldwide, causing severe memory and cognitive impairment. This often has a significant effect on patients’ mental health, leading to depression, stress and anxiety. It’s also an expensive disease: the World Health Organization (WHO) estimates it costs $600 billion, making it a global socio-economic problem. While researchers continue to unravel the mechanisms behind the disease and work out how to tackle it, it’s important that patients get the best possible care. Regular monitoring of the disease is part of this, and we’re working on a way to make this faster, easier and cheaper. Alzheimer’s disease is caused by high levels of a peptide called beta-amyloid in the brain, which leads to the degeneration of brain cells. Doctors use different types of scans and immunoassays, like MRI and ELISA, to estimate the amount of beta-amyloid in the brain. This gives them an indication of how the disease is progressing. But these scans require big, expensive equipment, and trained professionals. This can be challenging, particularly in developing countries and rural settings. Beta-amyloid can also be found in lower levels in blood, so it’s a useful biomarker to diagnose and monitor disease progression. There is a test that doctors can use to monitor beta-amyloid in the blood, but it’s not very sensitive and takes a long time. The test, called ELISA, requires relatively big samples and takes six to eight hours to produce a result – this isn’t so helpful if a doctor wants to know a patient’s status immediately. In our new review, published in Biosensors and Bioelectronics, we looked at each of the methods available to measure beta-amyloid concentration in brain tissue and in blood. None of the existing tests can be done at the bedside and all need special expertise and large samples. They also take a long time to generate a useful result. Even though the existing technologies we looked at are well established, we need to move towards small sample, high accuracy tests that can be used in all environments, from developed countries to rural settings. In our lab, we develop portable sensors that can help patients by supporting personalized therapeutics. 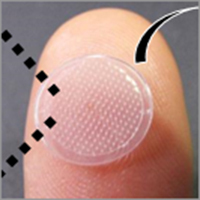 For example, we have developed an electrochemical sensor and tested it to detect cortisol – a stress hormone. It’s far better than the conventional technique, ELISA; it’s more sensitive and faster. Using similar technology, we’re now working towards something that can detect beta-amyloid. Our goal is to develop a test that’s sensitive, small and affordable – one that can measure beta-amyloid in the blood at tiny concentrations in just half an hour. The drugs used to treat Alzheimer’s disease can have side effects, so it’s better for patients not to overdose. With the right data, doctors can respond quickly to changes in a patient’s brain by reducing or increasing their dose. A sensitive, fast test would enable doctors to test a patient and see the results during the same appointment, so they could adjust medication to match the patient’s needs. It’s really a step towards personalized Alzheimer’s therapy. Ultimately, it could greatly improve people’s quality of life in the future. To develop the new biosensor, we need lots of biological samples from different places, species and stages of disease. This is challenging, and we’re still working on it. Once we’ve got all the samples, we will need to validate the system and compare it to the other tests available to see if it’s really better. It will take some time to reach the market, but we’re confident this could make a real difference in the future. 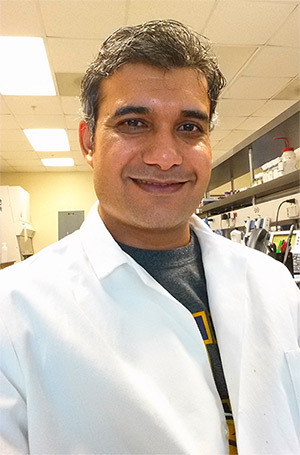 Dr. Ajeet Kaushik is Associate Professor at the Center for Personalized NanoMedicine in the Department of Immunology of Florida International University. He is exploring smart electro-active magnetic nanocarriers for on-demand site-specific delivery and controlled release of therapeutics across the blood-brain barrier to prevent HIV: a new approach towards neuroAIDS. He has worked as a postdoctoral research associate in the area of fabrication of BioMEMS-based electrochemical biosensors for biomarker detection using nanostructures at FIU’s Department of Electrical and Computer Engineering. 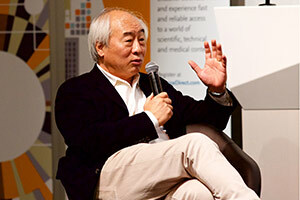 He has published over 80 international research papers jointly in the area of nanostructured platforms for biosensor and drug delivery applications. His main research interest is exploring nanomedicines and wearable sensors for personalized health care.